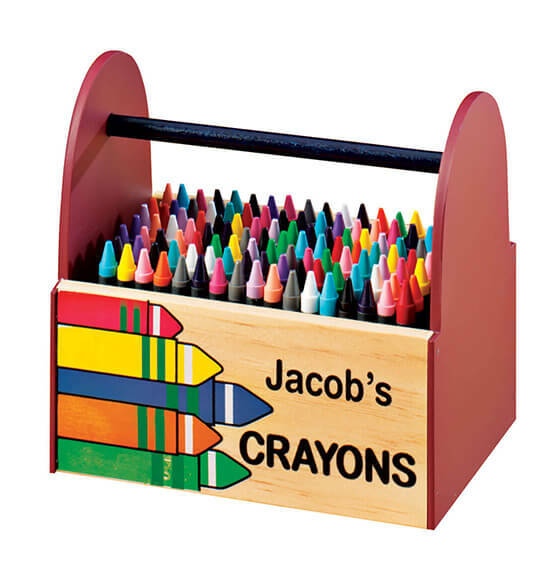 This personalized wooden crayon caddy is for one brilliant artist. 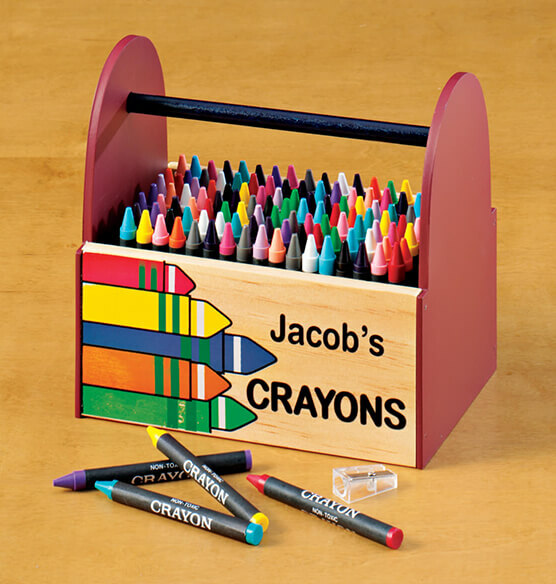 Easy-toting wooden crayon caddy keeps crayons organized and upright ... easy to find just the right color! Includes sharpener and 64 nontoxic crayons. Specify name; limit 1 line, 13 letters/spaces ('s is not standard; “Crayons” is standard). 6 3/4" long x 4 1/2" wide x 6 1/4" high. Personalized , Plain are not available at this time. I bought one for a friend, loved bought for myself too! I bought the first one as a gift for my friend's birthday who I got a lot of coloring books as well, the second one, I got for myself because I loved hers so very much! It is so full, I run out of room for all my colored pencils and markers, I had to put the crayons in my easter basket. but it is just lovely to pull out a colored pencil while coloring and just keep going on, and coloring, it makes it easy to find them all and to organize them if anything I need another to hold all my pencils and crayons. This was fun to order!! I belong to an adult coloring class, when I walked in with my 'personalized' crayon box, there were a lot of (ooo's & that's to cute)! Said. thank you, I truly enjoy this. I will keep on purchasing this product. I have purchased this gift for 3 of my grandchildren. They are very tuff to play with their toys. Good and durable material of the caddy's. I have more to purchase in the near future for gifts. Very happy with the product. The crayons are flimsy not a good crayon. Great boxes for children. I bought them as gifts. I will be ordering another one. Came assembled, packaged very we'll. Happy customer. I bought 2 of these for my 2nd cousins and am buying a 3rd for my other little cousin. I love how colorful it is and would have loved to have had one when I was a kid. It's sturdy and cute. Only draw back is the crayons that come with it. There are not enough of them to fill the caddy and they are not a quality crayon. I filled the other caddies with a different type of crayon. Also the crayon sharpener will be easy to lose but I have solved that by attaching it to the handle with some jewlery tiger wire and crimp beads. Over all if I hadn't love the product I would not be back to buy this 3rd one. I anticipate that in 3 more years; if it is still available, I be back to buy a 4th for my newest cousin. Gift for my 6 yr old nephew. I'm hoping he'll love it for years. like keeping crayons together. easy little hands to carry. the crayons could be nicer or charge less without crayons. bought our own crayons. I have this year become aquainted with this precious 41/2 year old little girl who has excellent motor skills for her age. She loves to color and draw. She tries to keep her crayons in the original box and of course that doesn't work too well for long. I think she will really lie this to carry and with her name on on it. LOOKS BIGGER IN PICTURE THAN IN REAL LIFE. I'm usually satisfied with your products. I have been a customer for years. I was embarrassed to give my grandson this gift. The stick is too short and the case falls which is dangerous for a 3 year old. The personalization is only on one side and the cheap crayons don't nearly fill the case. I am very disappointed! The photo in the add is deceiving as the crayons supplied don't fill half of the caddie (as shown in the photo). I will have to go buy more to fill it up. Also, the personalized name should be on both sides of the caddy. Not real happy with this. for my daughter. She loves coloring.